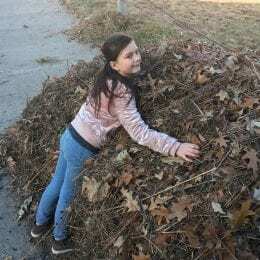 Big thanks to our end of 2018 volunteers! Susmita, Ruby, Krista, Karen, and Allen, we are grateful for you. Also, props to Lindsay, Marvin, and Jess for cutting back the season’s growth; and we have special gratitude for Joe Meyer and his team for hauling away the biomass. The Meadow will now await Spring. 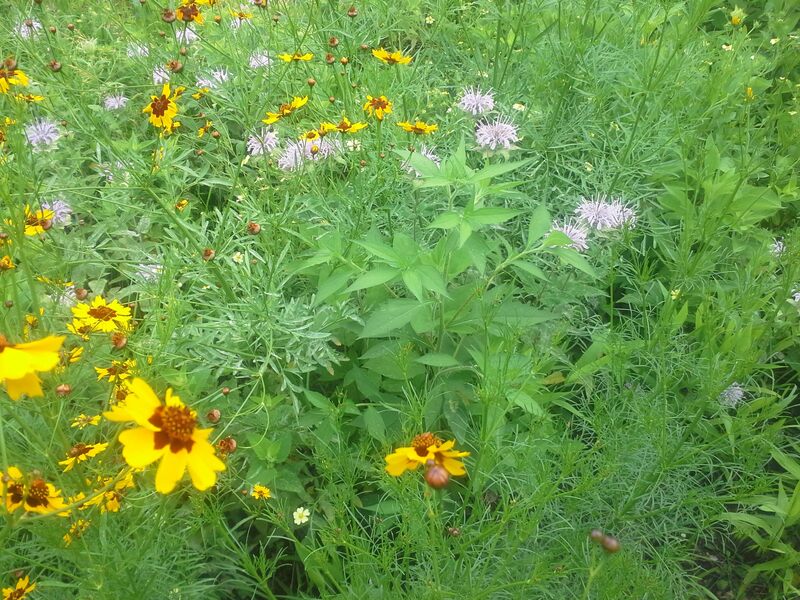 After two full growing seasons, this is the Meadow. Long view toward the Beach Museum of Art. Image courtesy of K-State Communications and Marketing. Plantings, path and hackberry bench. Image courtesy of K-State Communications and Marketing. Late summer texture of grasses and forbs. Image courtesy of K-State Communications and Marketing. 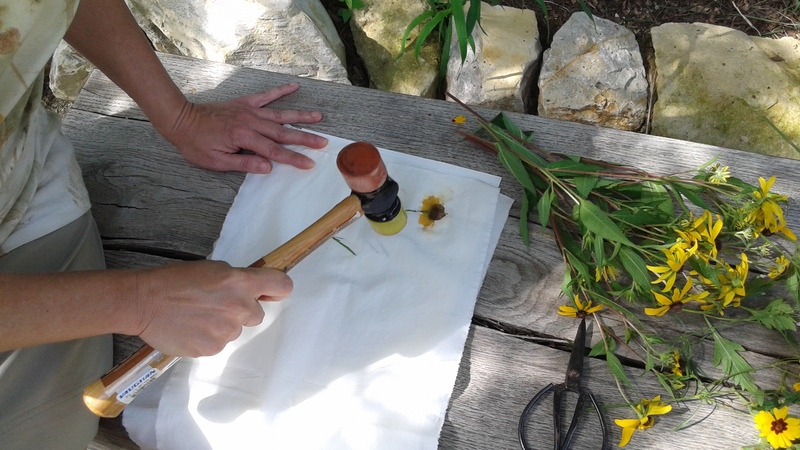 On an unseasonably cool, July day, I met Dr. Sherry Haar (of the Department of Apparel, Textiles, and Interior Design at K-State) in the Meadow for an intro lesson in natural plant dyes. 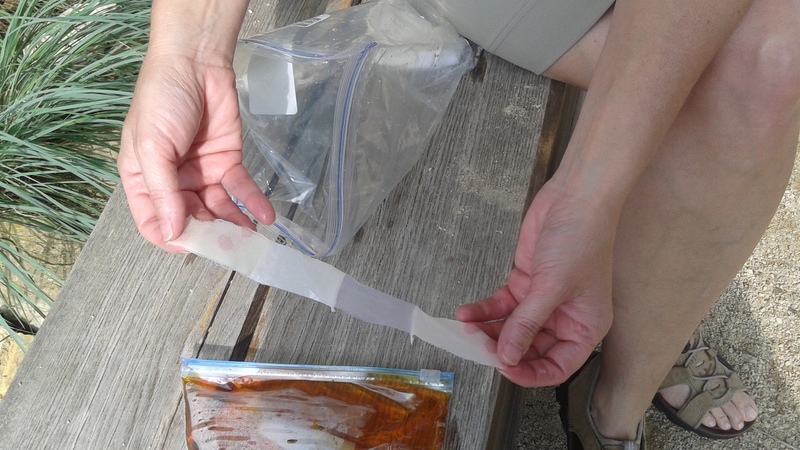 Dr. Haar began by testing several species of flower using fabric test strips. Each strip contains different samples of fabrics in a fabric family, such as silks, or cellulose fabrics (cotton, linen, rayon…). Haar holds a fabric test strip prior to dying. Image by Katie Kingery-Page. The test strip quickly absorbed a brilliant orange color from Coreopsis tinctoria (annual plains coreopsis). 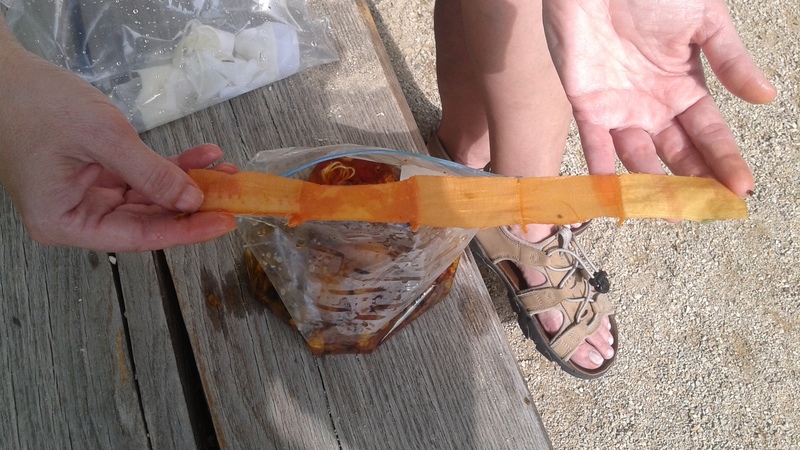 Test strip after just a few minutes in Coreopsis tinctoria liquor. Image by Katie Kingery-Page. Dr. Haar explained other processes she uses to experiment with natural plant dyes. 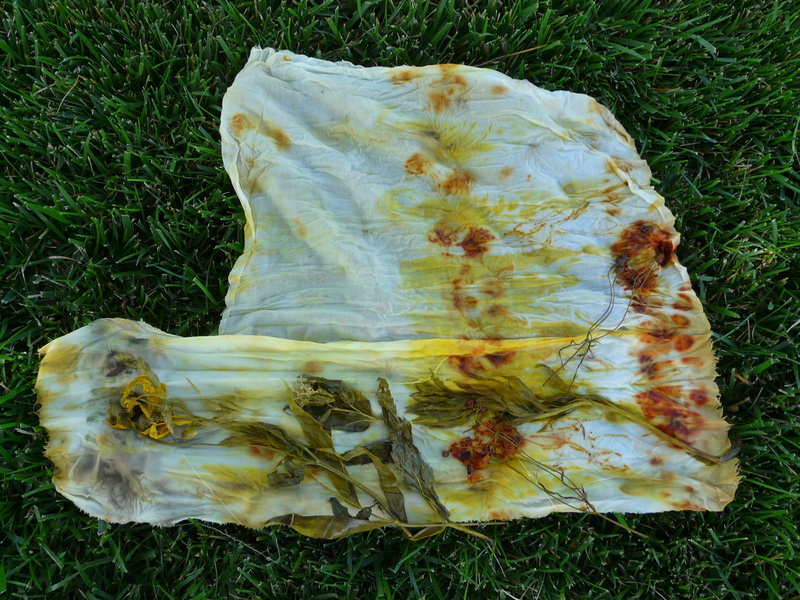 She will often “bundle” plants in fabric pre-treated with a mordant, to reveal what effects the flower, leaf, or stem of a plant may create. 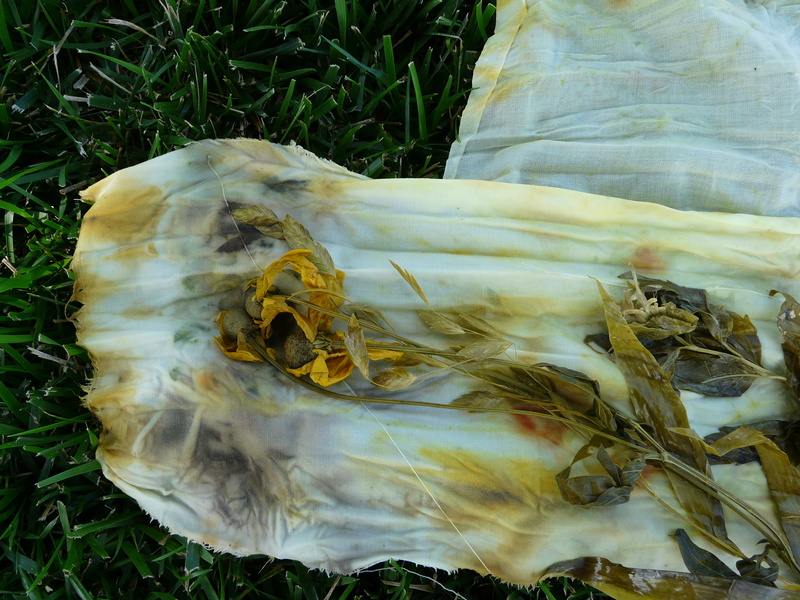 She also “pounds” plant material into pre-treated fabric, which results in brilliant colors with realistic pattern impressions of the plant’s structure. Dr. Haar prepares to wrap a bundle of native plants from the Meadow. Image by Katie Kingery-Page. A coreopsis flower begins to show through a top layer of fabric after pounding with a round-head hammer. Image by Katie Kingery-Page. Dr. Haar’s fabric designs are stunning; she has designed many fabrics for garments and other uses. 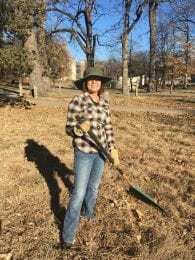 We look forward to her use and her students’ use of the K-State Meadow! 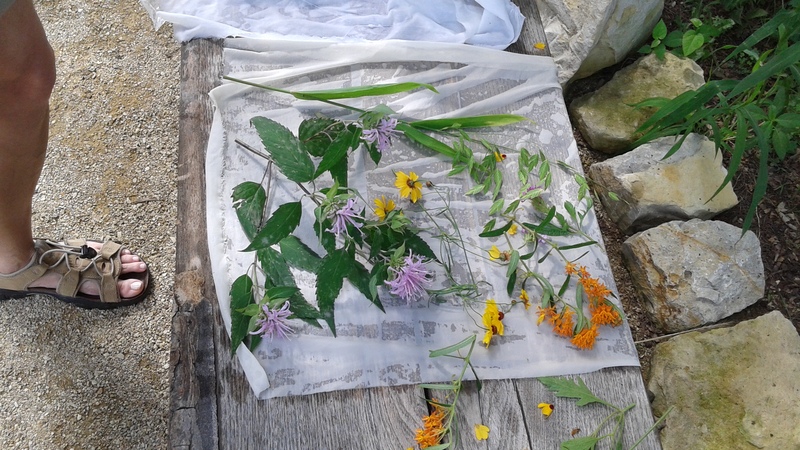 Postscript: After the Meadow visit, Haar placed the bundled plants in pretreated fabric in a sunny, outdoor location. A plant dye bundle. Image by Sherry Haar. 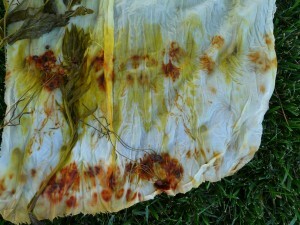 Natural dyes from Meadow Plants. Image by Sherry Haar. Friends of Trevor Davis plant wild blue indigo in his memory, early May 2015. Image by Richard Dean Prudenti. 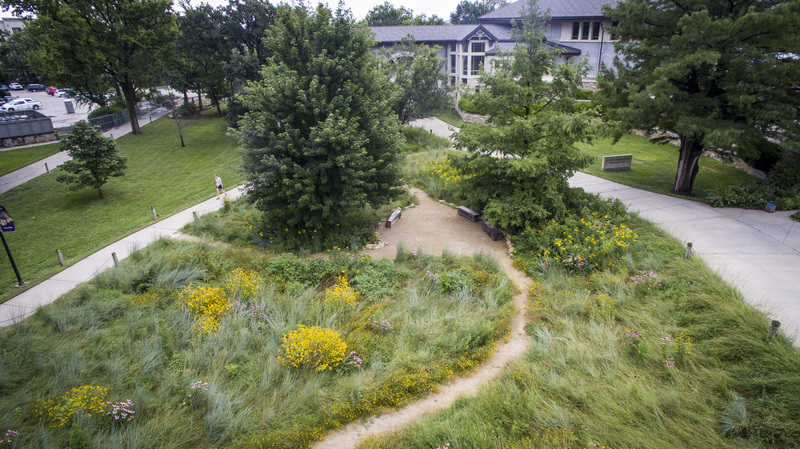 The Meadow was conceived, in part, as a contemplative space in the heart of the K-State campus. The Meadow’s initial installation was possible thanks to a memorial donation in honor of Professor William C. Hummel and Sara T. Hummel. 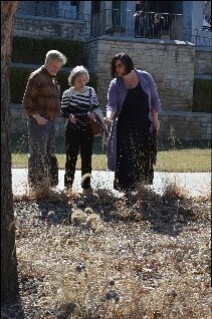 Descendants and extended family of the Hummels have enjoyed visiting the Meadow and often take part in volunteer work days. 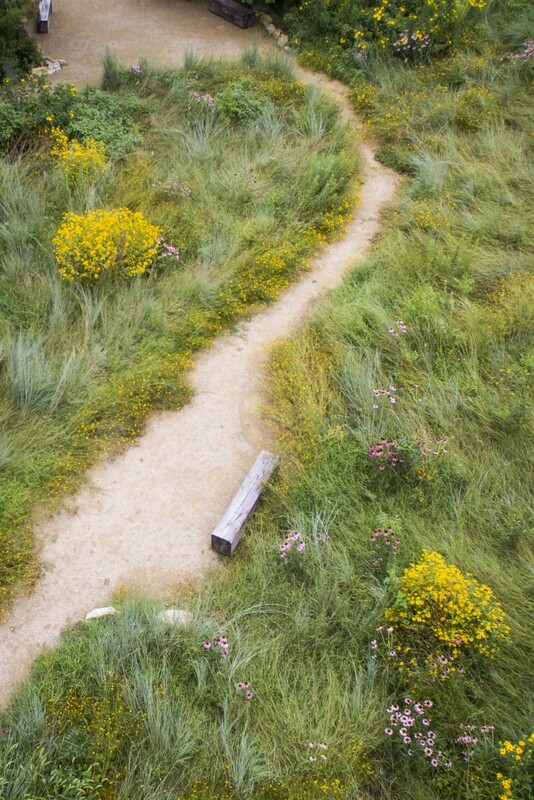 Summer 2015 brings a new layer of meaning to the Meadow. 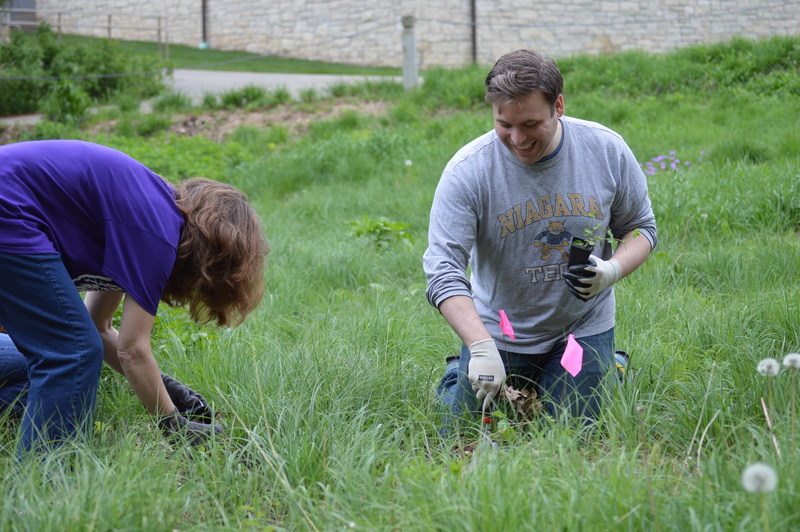 This spring, a group of K-State staff in the Division of Communications and Marketing decided to remember their colleague, Trevor Davis, through a contribution to plantings at the Meadow. Thanks to Mr. Davis’ friends, nearly 200 wild blue indigo (Baptisia australis) plants will blossom in the coming years. Wild blue indigo typically takes two years of growth before it blooms, so we’ll expect to see this purple tribute in 2017. Mr. Davis, a writer, is remembered by his colleagues as full of verve for life and a true joy to be around. 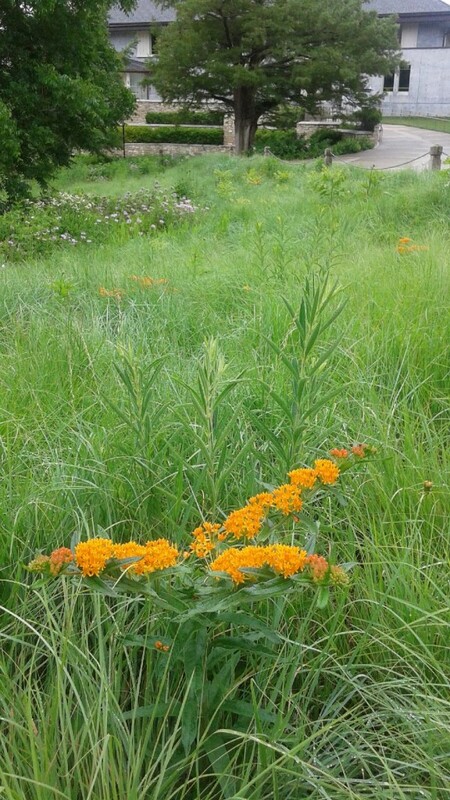 June 2015 Meadow after heavy rains. Image by Katie Kingery-Page. Winter in the Meadow, February 2015. Image by Lindsay Smith. Post written by Richard Dean Prudenti and Katie Kingery-Page. Seeding of the Meadow began nearly two years ago. 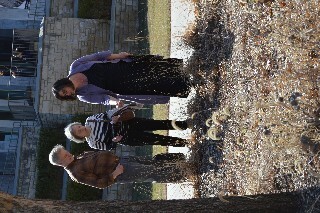 In that time the campus and community have witnessed the growth of a native plants landscape at K-State, just north of the Beach Museum of Art. Many people have shown great appreciation for the plants, the habitat and the landscape design elements. This became apparent when Richard Prudenti (graduate student in landscape architecture and co-author of this post) provided a tour of the Meadow for several alumni of landscape architecture during the 50th Anniversary celebration of the landscape architecture program at K-State. 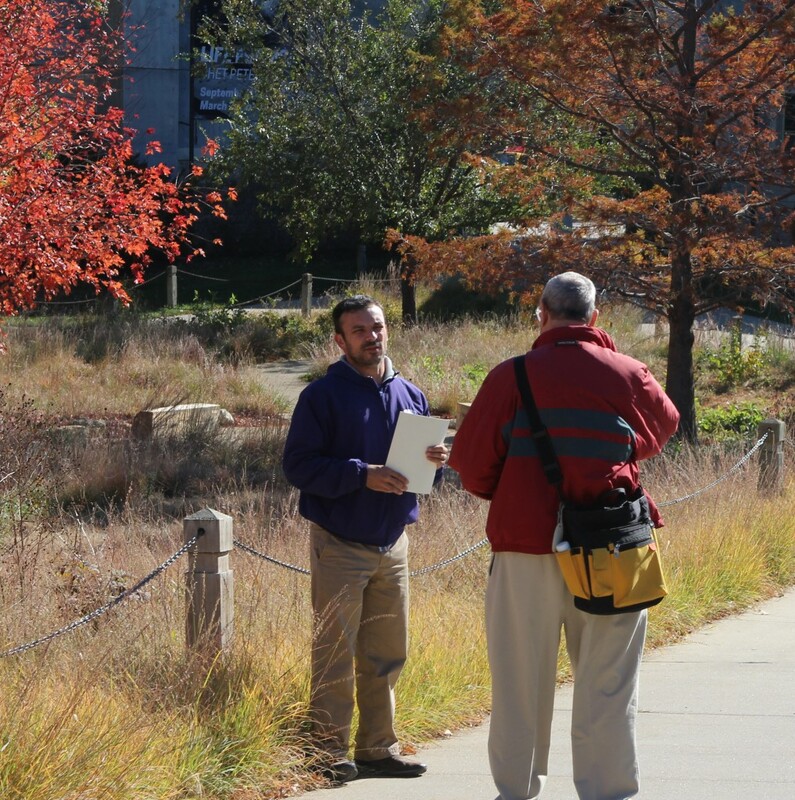 MLA student Richard Dean Prudenti leads a K-State alumni tour of the Meadow, November 2014. Image by Taylor Lininger. Q: Will we replace the current tree inventory with native trees? A: The site currently holds six trees; two are native to Kansas: a Chinquapin Oak and an Eastern Red Cedar. The trees provide shade conditions that are much denser than that of an upland prairie, but this canopy does evoke a savannah-like feeling. Understanding the amenity of healthy trees in a campus environment, it makes sense to preserve these trees for their qualities of shade and enclosure of space. 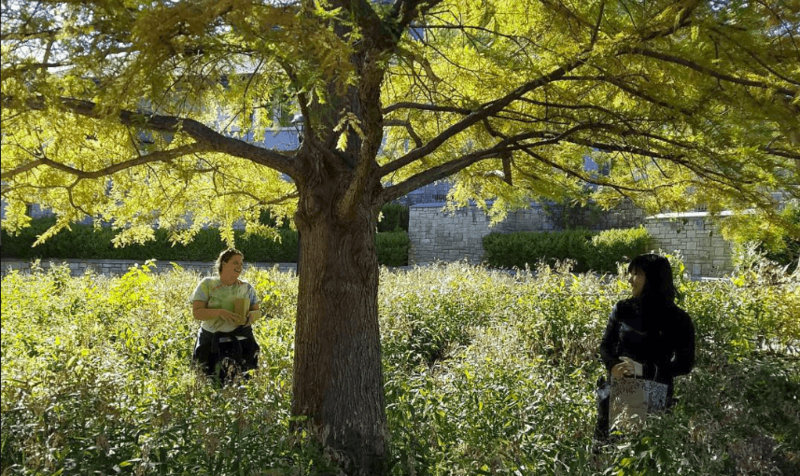 To a purist, preserving the healthy non-native trees that came with the site might be anathema, but the Meadow is a landscape of compromise between human needs and the desire to showcase native plants. Our plan is that in a few more years, the Meadow can sustain itself and require very little maintenance. 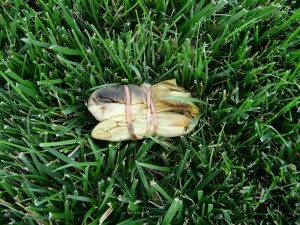 But just as in a natural grassland, tree seedling growth must be suppressed. Currently, seasonal mowing suppresses seedling trees in the Meadow. Q: How was the under-story of plants designed? A: The plant palette is drawn from the documented plant composition of the nearby Konza prairie, and includes species selected for a cohesive aesthetic effect as well as creation of animal habitat and a resource for understanding human use (for example, some native species are used by pollinators; others have been used by people for food and dye plants). Species were combined in five different mixes in response to sun/shade and edge conditions of the site. 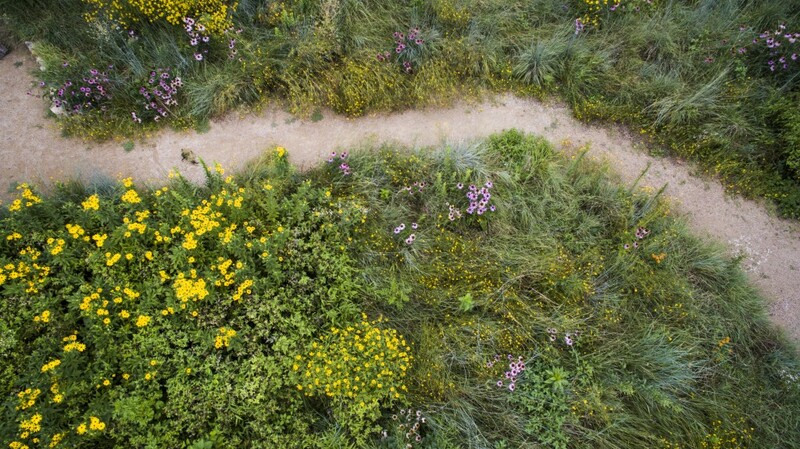 Still in its second year and a work in progress, it will take 3-5 years to reach the point where the Meadow maintains a dynamic equilibrium of native grasses and wildflowers. Schematic planting areas, by condition. Image by Katie Kingery-Page, 2013. During the 2014 growing season, transplantation of plants from K-State greenhouses increased species on site from 20 to more than 40, including milkweed and other species that provide food and habitat for Monarch butterflies and other pollinators. 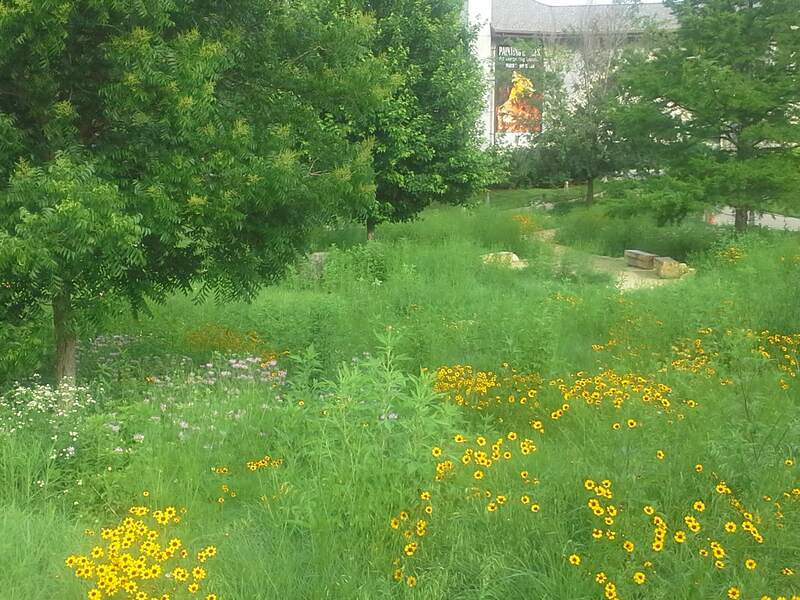 In the future, monitoring pollinators will be paramount to validating the Meadow’s existence and perhaps supporting the creation of additional “meadows” on campus. Q: Will the Meadow be burned at some point? 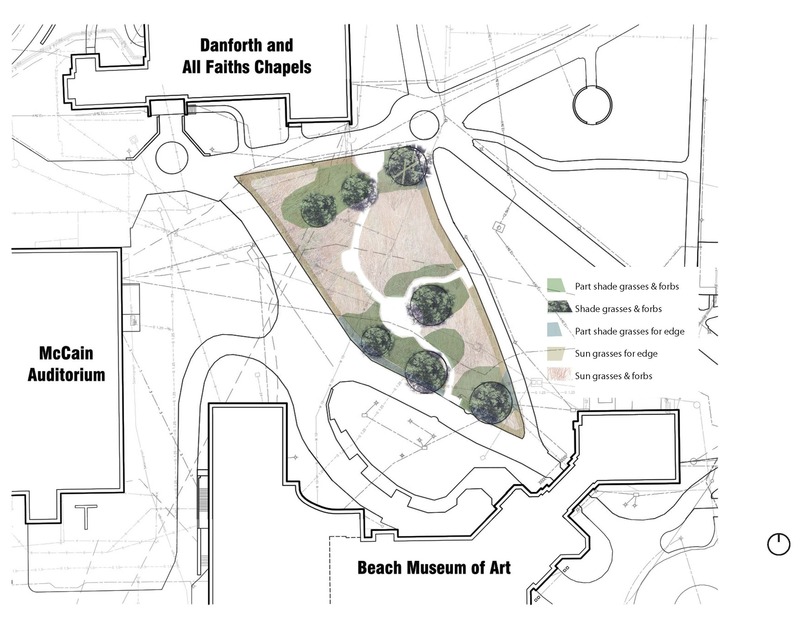 A: Gaining permission for controlled burns is a concern, especially as close as the Meadow is to the Beach Museum of Art, McCain Auditorium, All Faiths Chapel, and other campus buildings. We feel a controlled burn could be safely planned as a celebratory and educational event. If the planning team is successful in obtaining permissions, a burn still cannot be held until the plants have sufficient root growth to survive a fire–typically not until 2-3 years after planting. Q: What are the sustainability goals of The Meadow? A: We have altered the landscape from turfgrass to native plants with far less water and chemical use than conventional lawns. Once fully‐established, the Meadow’s need for herbicides/pesticides and water usage beyond rainfall should be minimal or nonexistent. 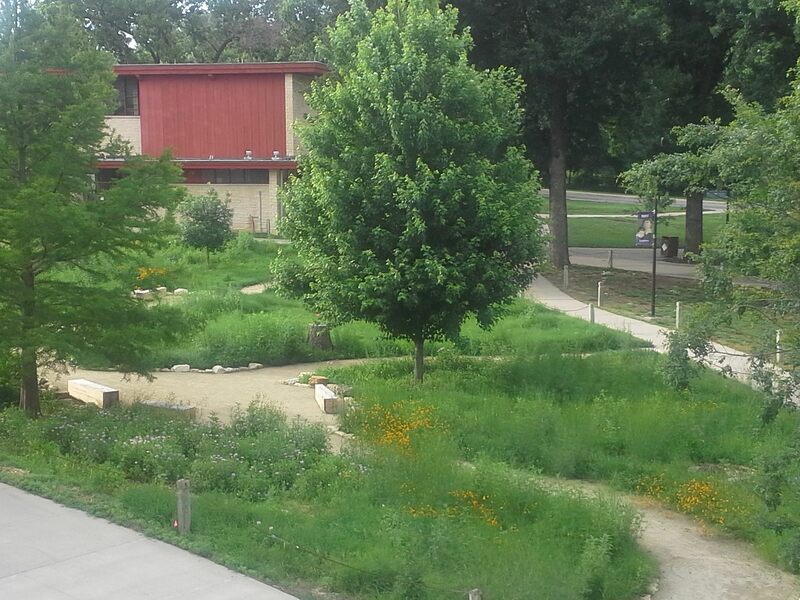 In addition, we believe the Meadow will decrease stormwater runoff into existing inlets on the site. We hope to begin monitoring stormwater runoff, chemical and water inputs, in comparison to a typical campus site, later this year. Q: Will there be lighting in the Meadow? A: Currently there is not a budget for expanding electrical service on the site and adding light fixtures. Our aspiration is to develop artful lighting. Q: How is this landscape funded? 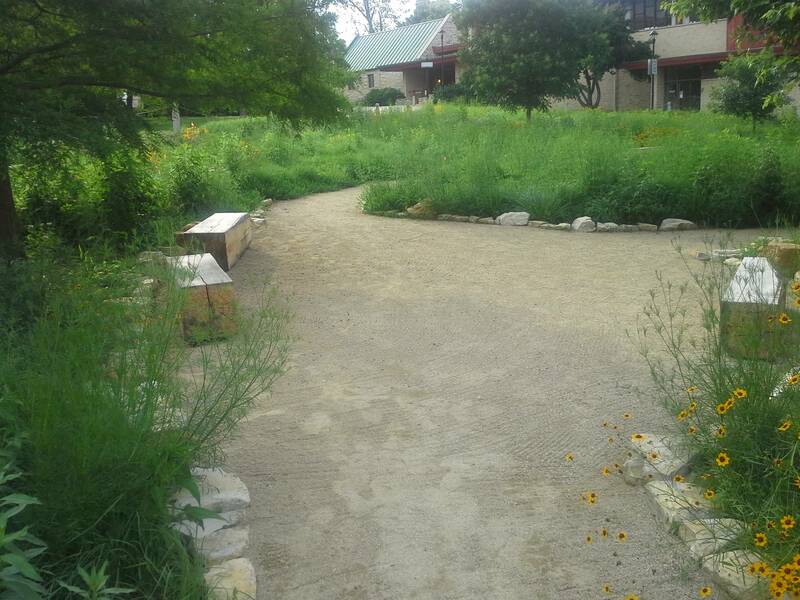 A: Thus far, the Meadow has been made possible by the generosity of private citizens such as the Hummel family (William and Sara Hummel Memorial Fund) and the Henley family (John and John T. Henley Meadow Excellence Fund). K-State’s Green Action Fund, a pilot fund through the Student Government Association, has also provided support. In addition, numerous in-kind hours of work have been given by faculty, staff, and community. We continue to seek out funds to accomplish a number of objectives. Q: How will the memorial function of the Meadow be visually expressed? A: From the beginning, the Meadow has served as a living memorial, which will be recognized on a sign planned for summer 2015. Since the construction, several people have approached the planning team asking that further memorials be incorporated in the Meadow. 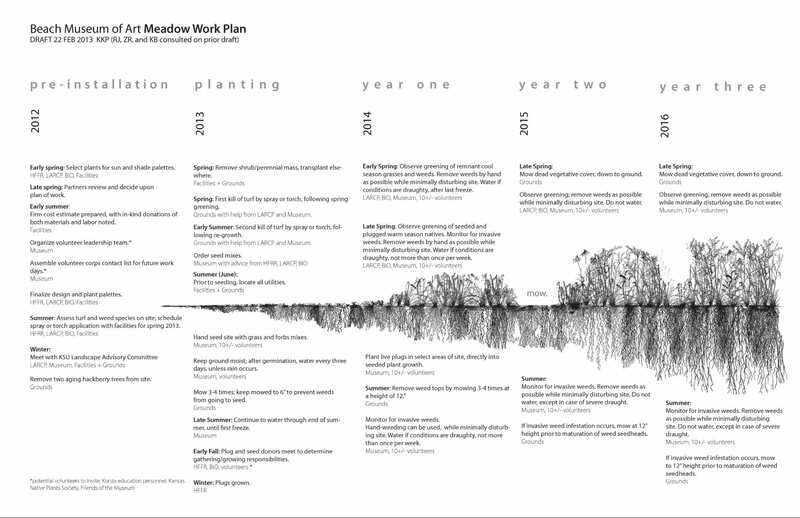 The Meadow planning team feels that for the meadow to function as a contemplative landscape, it must remain free of visual clutter. Thus, people have developed creative and meaningful ways to memorialize, including sponsoring and participating in planting days and donating seating elements. 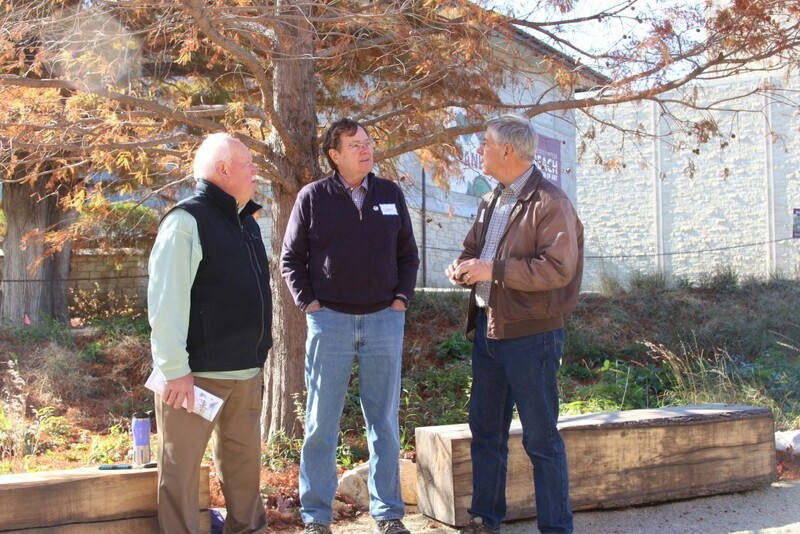 K-State alumni tour the Meadow, November 2014. Image by Taylor Lininger. Q: Will there be signage to explain the goals of the Meadow? A: Every effort is being made to preserve the visual aesthetic of the Meadow. A subtle sign planned for the Meadow will refer visitors to a touchtable exhibit inside the museum. This display of visuals and information is currently under construction. Q: Will we be monitoring the changes in soil and habitat, the use of water, etc.? Erosion and sediment control (the former turfgrass had areas of erosion from runoff and native plants now slow and capture sediment). 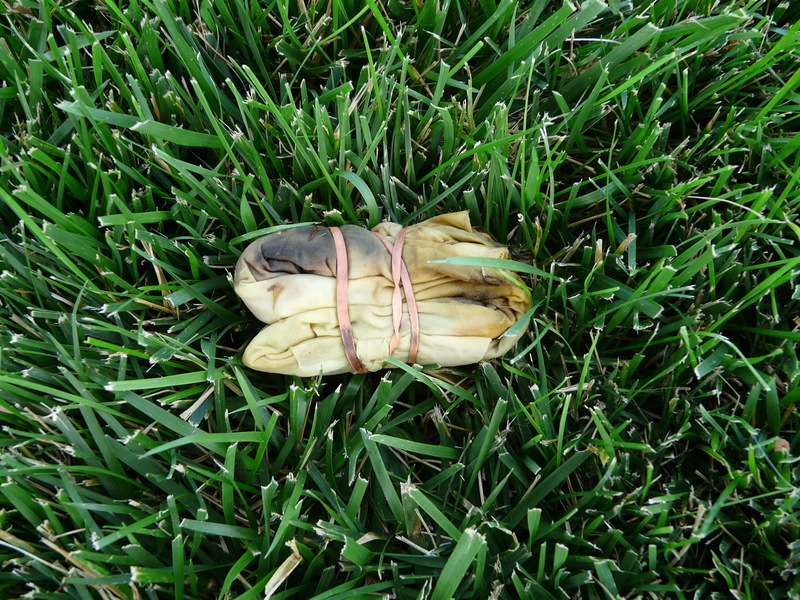 In Fall 2014, faculty from the departments of Landscape Architecture/Regional & Community Planning and Bio-Agricultural Engineering applied for an EPA grant to monitor several sites on campus. 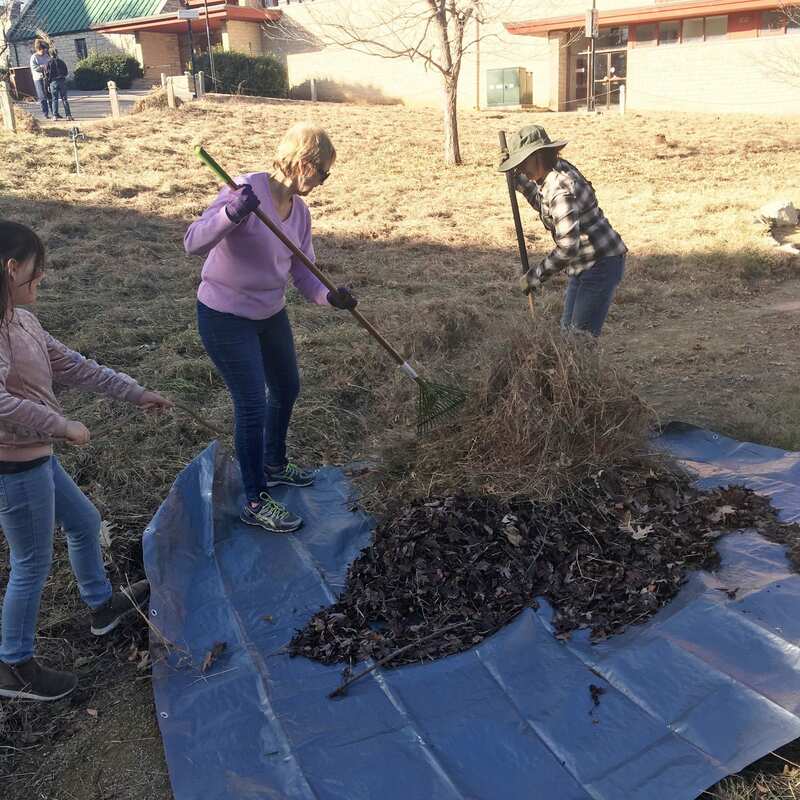 The research anticipated at the Meadow will compare the chemical and water inputs as well as stormwater infiltration at the Meadow to a typical turfgrass area of equal size on campus. Q: What is the primary goal of this project? A: One of the overarching goals is to heighten awareness of the need to protect grasslands worldwide. More than 49% of grasslands have been destroyed worldwide and only 4 percent are currently protected. The Meadow is a setting for careful observation, discussion, and drawing activities, encouraging visitors to make meaningful connections between art, science, and enjoyment of the natural world. The site fosters lifelong learning about the Flint Hills ecoregion and sustainable landscape management. 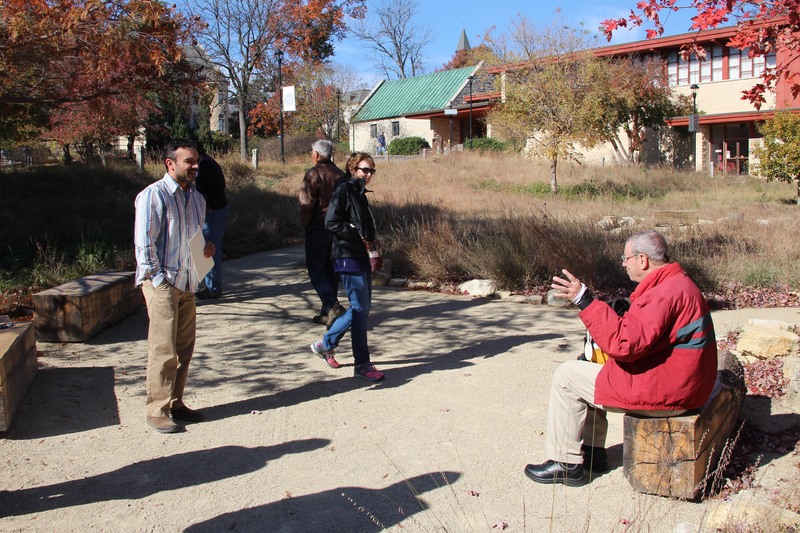 We greatly appreciate those who participated in touring the Meadow fall 2014. 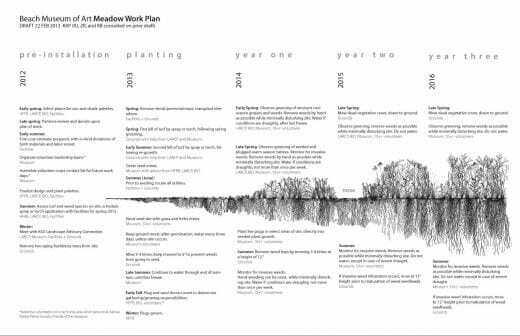 Your interest in learning about the Meadow, its purpose, and what we might be doing next proved quite valuable in our planning efforts. Your thoughts and responses to the Meadow experience will continue to help us as we develop the Meadow. Getting ready to sow seed in Dr. Janke's greenhouse for Meadow plugs. Pictured (left to right): K-State biology PhD student, Zakary Ratajczak, and K-State landscape architecture grad student, Caleb Melchior. Image by Richard Dean Prudenti. With the cold winter behind us and the advent of spring, volunteers are returning to weed and plant a second wave of species in the Meadow on the campus of Kansas State University. 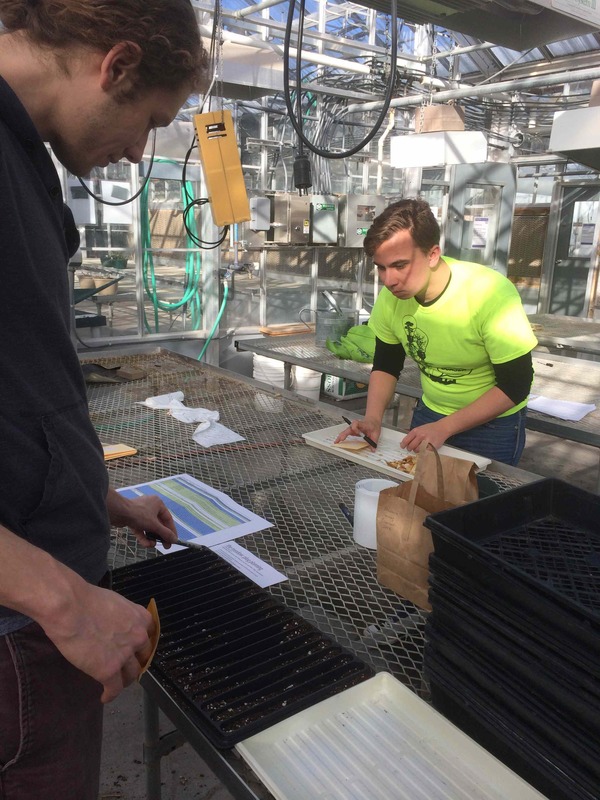 Less obvious, however, is that even in the heart of winter, volunteers and team members have been busy: starting in late January a team of students, faculty and staff sowed seed that had been stratified in cold storage within greenhouses in the northwest area of campus. 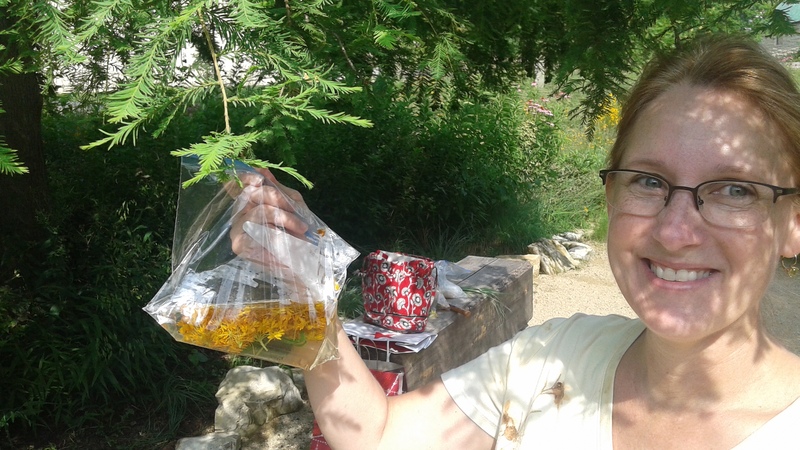 Seeds were either purchased through monies provided by the Green Action Fund or donated by Valerie Wright, retired environmental educator for the Konza Prairie Biological Station and adjunct professor of entomology at K-State. 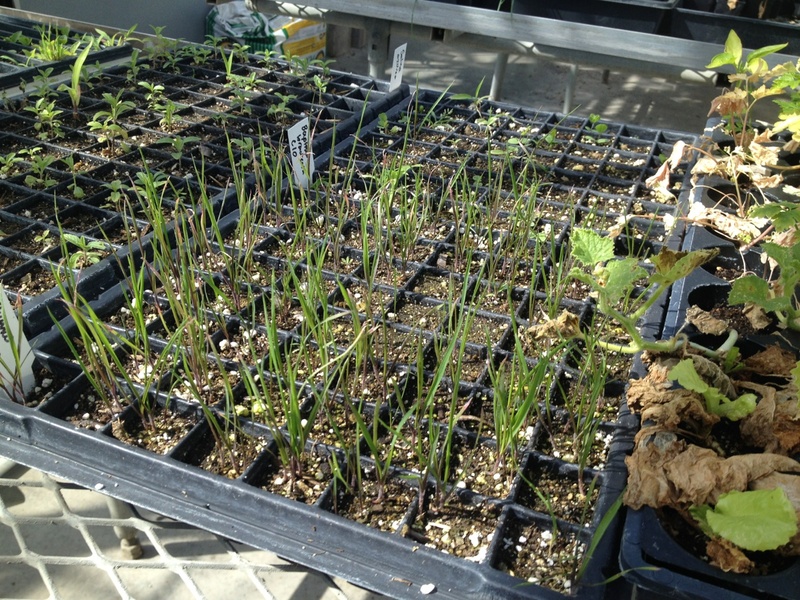 Prairie plants are now growing in the greenhouse. 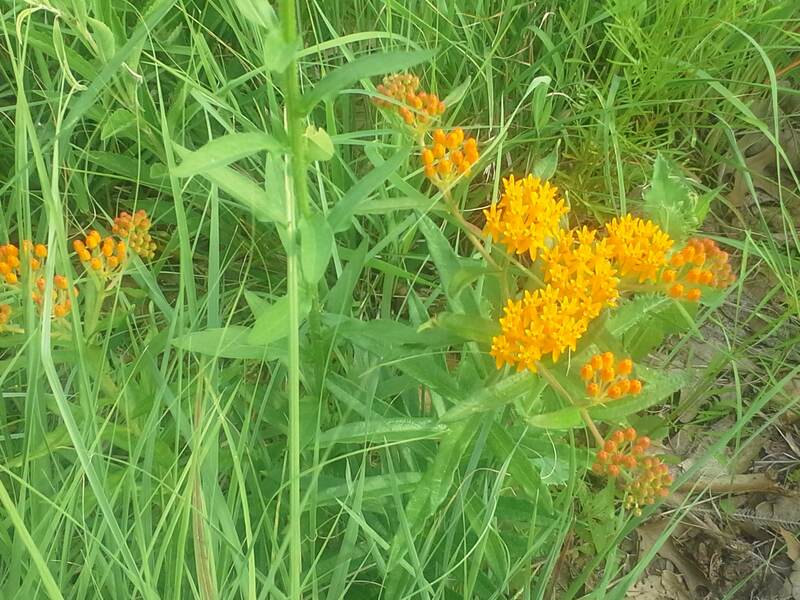 These native plants of the Kansas Flint Hills will be transplanted to the Meadow in the coming weeks to increase species on site from twenty to more than forty, including several milkweeds and other species to provide food and habitat for Monarchs and other pollinators. 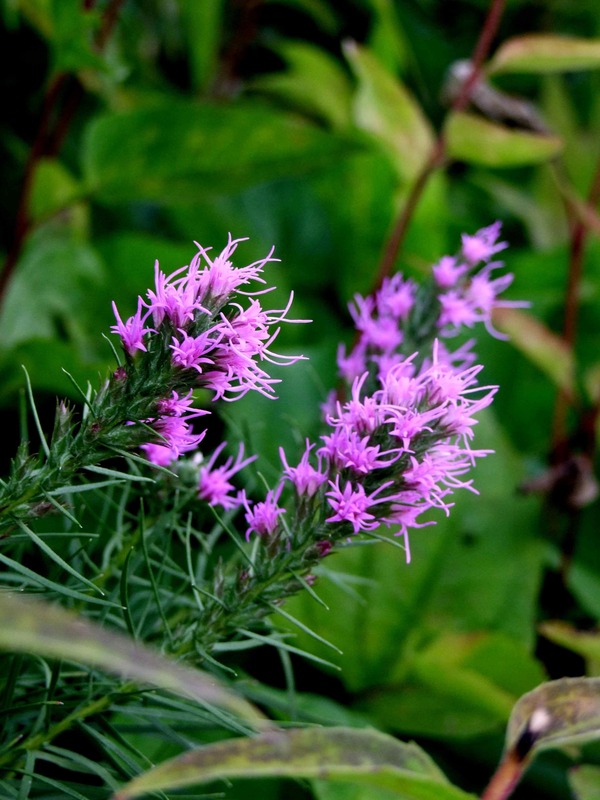 Blazing star (Liatris). Image by Caleb Melchior. Professor Rhonda Janke, Extension Specialist & Sustainable Cropping Systems, generously donated soil, supplies and space at the mist house on campus. This has allowed plants to stay hydrated in a controlled environment monitored by professors and students. Leading the effort is master’s student in landscape architecture, Caleb Melchior. He selected plants to grow from the existing Meadow palette as part of his master’s thesis work. Caleb collaborated with Troy Britt, an undergraduate student in the department of art and an employee of the Beach Museum of Art, to create a series of designs for adding the new species with visual impact. Zak Ratajczak, Biology PhD candidate and graduate teaching assistant, Melchior, his major professor, Katie Kingery-Page, and Dr. Janke received funding for the second wave of planting through K-State’s Green Action Fund. Also part of the plug growing team is Richard Dean Prudenti, an employee of the Beach Museum of Art and a first year student in the post-baccalaureate program for landscape architecture. 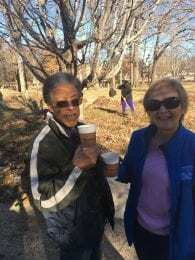 Thank you, Green Action Fund, Dr. Janke and Valerie Wright, for making the plug growing possible!